We took Drew to Provino's to celebrate his birthday. And it wasn't just because he got a free meal and dessert, it was because.... okay, it was because it was free. So sue me. But who doesn't love some Italian for dinner? It's difficult for a three year old to grasp the gravity of a birthday. I think that Drew has been a little confused by all the attention today. Like, I'm not totally sure why Mama sent two dozen cupcakes to preschool this morning, but hey - I'm not complaining! After we were stuffed with carbs, the waiters and waitresses sang the infamous off-key birthday song to Drew. It makes adults cringe but makes kids giddy like Christmas morning. He loved it! The surrounding tables joined in the sing-a-long fun and wished Drew a "Happy Birthday!" They also said how cute he is because he's totally cute. Duh. 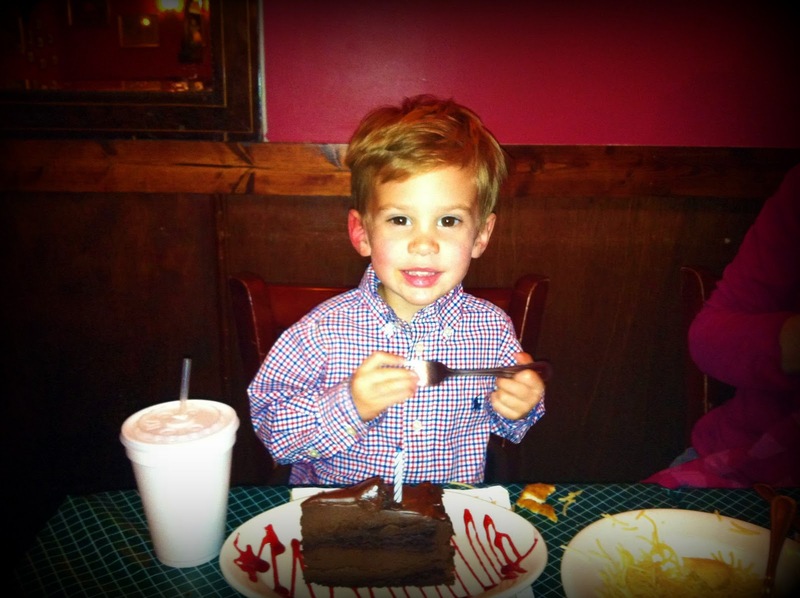 Drew was overwhelmed by holding the attention of the entire restaurant - the song, the applause, the "oh, he's so cute! - and he panicked. Proud Mama moment right there, folks. I should probably talk to Drew about how to appropriately fill uncomfortable silences. Tomorrow. Because today is his birthday and he can say poop all he wants. Happy Birthday, Drew! We asked for a piece of cake as big as his head. I guess they took us seriously.